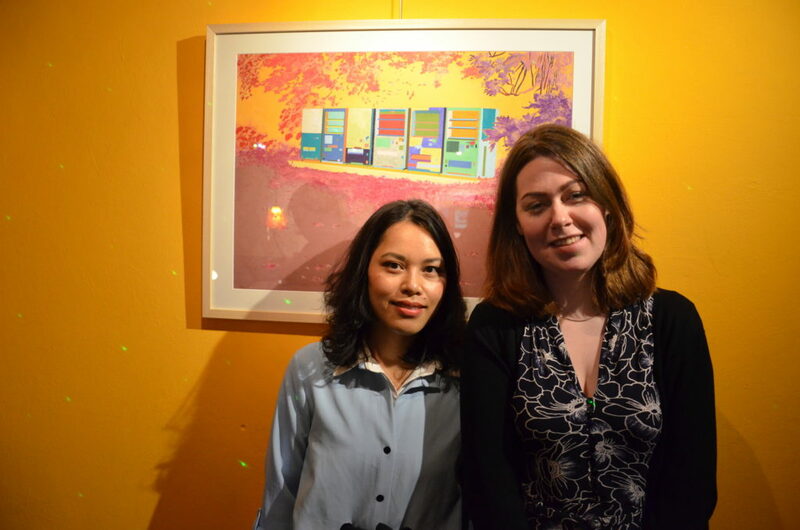 Yesterday, Yana Poppe, a Dutch artist with Indonesian roots, opened her solo exhibition “Everyday Japan” in Oude RKZ, presenting a new series of paintings showing the daily life in Japan. The core part of her work: Brightly coloured vending machines of all shapes and sizes. Her work can be viewed and purchased until 24th of January. 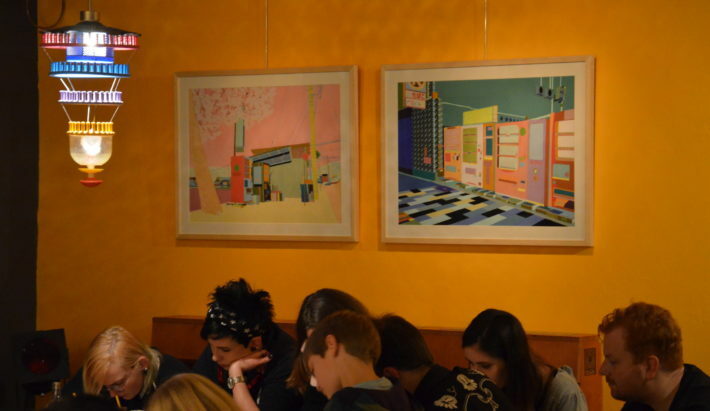 “I paint the urban environment and focus on its structure”, that’s how Yana Poppe, who studied at the Minerva Academy in Groningen, explains her way of painting. Longing for a yet unknown place, her pictures seem like a dream: Colourful lines done with fine brushstrokes form daily devices such as vending machines, giving them a bit of a fantastic, outerwordly appearance. Having visited Japan several times for workshops and artists in residence-projects, Poppe uses the traditional painting technique Nihonga, which became known as a term in the late 19th century to distinguish Japanese art from the Western culture of oil painting. 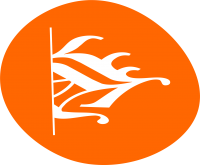 Nihonga is characterized by the use of traditonal techniques and materials, such as washi, handmade paper, on which Poppe also paints. 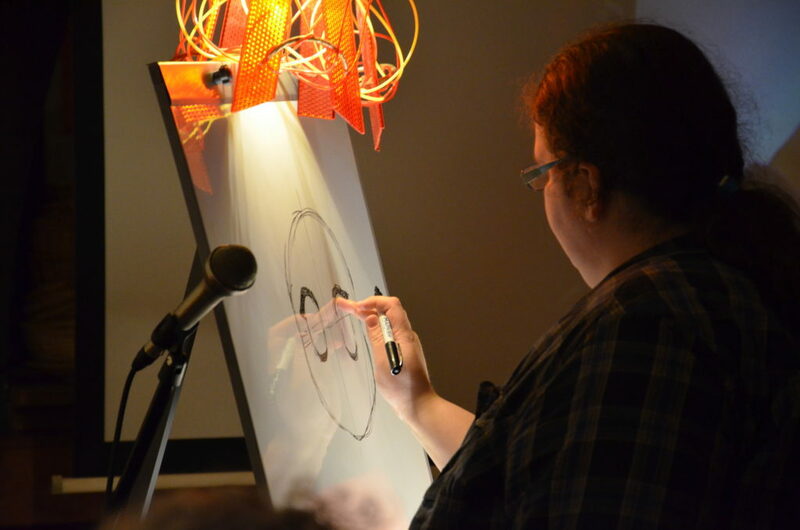 Poppe’s evening in Oude RKZ doesn’t start with long speeches and acknowledgements, but with a bit of DIY: Marjolein de Jong, a local character artist and animator, gives a short Manga-Workshop. 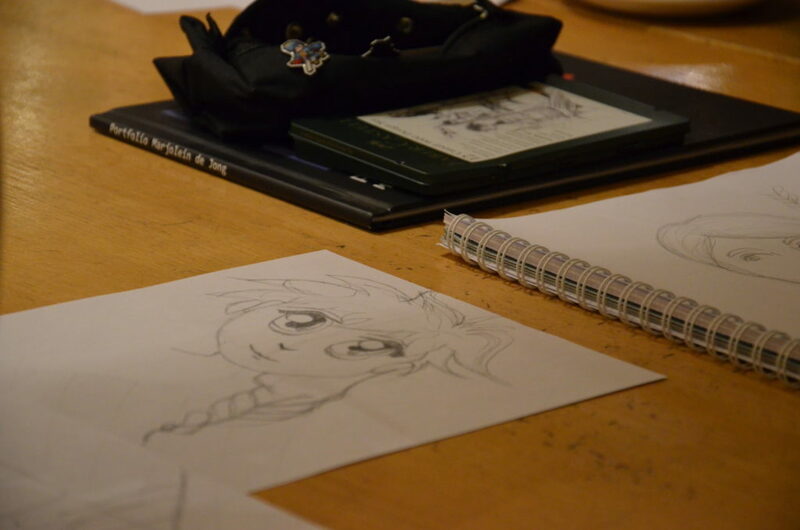 Sitting together at large wooden tables in the cosy atmosphere of the café, Poppe and her guests learn step by step how to draw a girl with the well-known giant Manga-eyes, before the exhibition is officially opened. Within forty minutes a dozen formerly white sheets are filled with Manga girls, glancing up at observers with a cute look. Marjolein de Jong walks around between the tables satisfied, before handing over the microphone to Philo Ouweleen, a Dutch Japanologist, for the official part.